Does Your Audience Care About Design? Home / Blog / Web Design / Does Your Audience Care About Design? You’re likely familiar with services like Readability and Instapaper that aim (in part) to make reading better by stripping away the boilerplate of a website and serving up the content in minimalist style. Safari users may be familiar with the Reader button that also strips away boilerplate and sometime in the fall iOS5 users will take that further with Reading List. You can add feed readers to the list of ways readers are absorbing content without design. On the opposite end we have art direction, where pages are specifically designed based on the page copy, while still working with the overall brand of the site. These things seem to be in opposition. One is adding design to content while the other is stripping it away. As more people are turning to services like Readability and Instapaper some are drawing the conclusion that people don’t care about design. I disagree. I want to talk about a couple of design principles that point toward people preferring design. After walking through these 2 principles I’ll bring the discussion back to art direction and design vs minimalist reading services. The famous example of performance vs preference is the Dvorak keyboard seen above. Developed in the 1930s the Dvorak keyboard has been shown to increase typing efficiency by roughly 30%. If you ask most people if they’d like to type 30% faster with fewer errors they’d all say yes. Are you currently using a Dvorak keyboard or the same qwerty keyboard most everyone else uses? One or two of you might use Dvorak, but my guess is most are using qwerty. It’s the keyboard we’re all familiar with. It’s the one that comes with every computer by default. Switching now would mean retraining our fingers and relearning how to type. Even with the knowledge that Dvorak is the better keyboard are you planning on getting one? Probably not. The	reasons people prefer one design over another are a combination of many factors, some of which have nothing to do with performance. Does it conform to my standard way of doing things? Do I need to relearn something to use it? A better mousetrap isn’t necessarily the most popular mousetrap. When designing we need to consider as many factors as possible in regards to the preference of our audience. Better performance will play a role, likely a large one, but it isn’t the only factor. To find out what people truly prefer we need to observe them interacting with our designs. What people say they want isn’t always what they really want. People are also generally poor at differentiating features they like from features that improve performance. Think usability testing over focus groups. In processing our visual surroundings we all form opinions and judgements that affect future visual processing. These quick and early perceptions are resistant to change and bias subsequent interactions. Early visual impressions ultimately influence long-term use. We also have a bias toward attractive things. We perceive attractive, aesthetically pleasing people and things more positively. Because we feel more positive about an aesthetically pleasing design we find that design easier to use. Whether or not the aesthetic design really is easier to use is irrelevant. We think it is and as a result we spend more times with it. We use it more and as a result learn to use it better. In time the aesthetically pleasing design may really be more usable because of our extra experience and knowledge using it. On the other hand a more usable design that’s aesthetically unappealing can suffer from a lack of acceptance and use. If no one is using your usable design how usable is it? Aesthetic designs result in a positive emotional response. They make people more tolerant of mistakes and flaws and problems with the design. The feelings of affection we have for more aesthetically pleasing designs can lead to product and brand loyalty. They can promote creative thinking and problem solving. Aesthetics can even communicate function. Negative feelings about a design do the opposite. The can stifle creativity and lead to narrow thinking. This is especially true in stressful environments and often leads to a reduction in performance. Making things beautiful has a great impact in making them more usable. So what about art direction? What about design? Are readers telling us they don’t care about aesthetics? Services like Readability, Instapaper, and soon Reading List are gaining in popularity, however that doesn’t indicate that people don’t care about design. Reread the 2 principles described above and think about whether or not design is important. Something doesn’t seem right. The design principles above tell us people should should prefer reading designed content in a browser, but more and more seem to prefer reading in a way that bypasses the browser. There are a couple of explanations for this seeming incongruity. 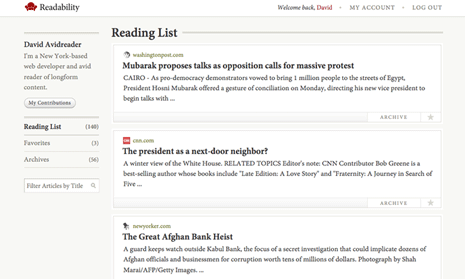 Services like Instapaper and Readability make reading more convenient, which isn’t really a question of visual design. Part of the growing success of these services is they allow us to read content when we have more time to read it. Where design is concerned most people have unfortunately been given poor design. The focus of the design of many sites is on anything but the content. The focus is on the ads, the brand, the calls-to-action, everything but the content it seems. Consider how Readability presents content. It’s very well designed and quite beautiful in my opinion. Is it any wonder people choose it over reading many sites directly? For designers the takeaway shouldn’t be that we need to strip away everything, though it’s probably a good start. The takeaway should be that we need to create quality and aesthetically pleasing designs focused on what our audience wants, our content. Create a better reading environment and your audience will be happy to read inside your design. They’ll gladly use services to mark something to be read later and then click through to your site to do the reading. Design is important. It plays a large role in the success of any content, whether that content is an interesting article or sales copy to help sell a product. With so much information online people are turning to services where they can read content later and often in a stripped down fashion. This isn’t a reaction to design. It’s a reaction to time constraints and bad design. Principles like performance vs preference and the aesthetic-usability effect show us that design can have a great impact in what people prefer and in how easy a system is to use. What we should be taking away from the popularity of Readability, Instapaper, and soon Reading List, isn’t that our visitors want less design. We should be realizing that they want more quality design. I think services like Readability and Instapaper or my ClipR http://code.google.com/p/clipr/ are popular because we failed to give priority to the content. Many newspaper and other sites give priority to Ads (because there are main income of money) and links, the content is hidden somewhere. If every article is well art designed and the information architecture is correctly done there will be no need of one stamp services. I think that this is the period of awakening when we realize the importance of the content and how to shape that content, Internet is still very young medium we just need to help it to grow correctly. I agree. So many designs seem to be focused on everything but the content. I certainly understand the need for ads, but the priority should still be on the content itself. I think you’re right about this being a period of awakening. Hopefully most web designers are beginning to better understand what their audience wants (the content) and are learning to create designs that enhance that content and put the focus on it. No; but, if you entertain them visual, it’s a yes. 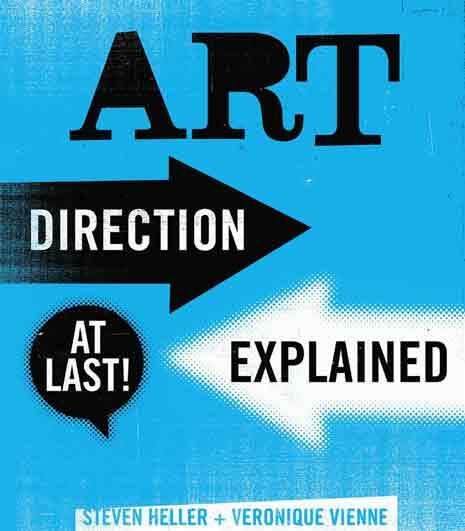 Art direction is exactly about what it says… direction, which is really “flow” by the way. It just enhances the comfort of the reading paths. As for the readability, it pertains to the alignment of design elements and text. Thus, by reinforcing “structure,” readability reduces the possibility of further confusion and/or discouragement. So you really want to know which one is better? It’s readability. How can you make someone comfortable to read, when they’re already confused/discouraged about how reading? Readability is definitely important and for most content it should be our primary focus. However I think the added visuals can also be important to help direct the eye around the page. We want to make it easy for people to read our content, but we still want them to notice some of the things around the content. I’m not sure it has to be an either/or choice. If I have to choose though I do agree with you that readability is the more important. Wow, what an incredible article! Though not integral to your point, stating that QWERTY keyboard layout being slower than the Dvorak one is, in fact, a myth. Thanks for the link Tim. Interesting. I hadn’t seen that research before. Most everything I’ve read suggests Dvorak does increase typing, but I certainly haven’t seen every bit of research out there. Careful with your words: “myth” can mean either “outright false”, or “accepted model” (without any implication for truth or falsehood). It is definitely part of the mythology of Dvorak that it is faster, just as the mythology of the Red Baron is that he was a frighteningly good fighter pilot. His reputation has taken on a life of its own, but that doesn’t mean he wasn’t actually a great fighter pilot, too. The Liebowitz/Margolis paper is interesting, but note that it (correctly) never makes the point that QWERTY is superior, or even equal to Dvorak. It only points out that most of the historical evidence in favor of Dvorak is scientifically flawed. That doesn’t mean Dvorak isn’t (or is) faster — simply that there isn’t a glut of scientific evidence for it. While we don’t have solid evidence, that doesn’t mean it can’t exist, or that we shouldn’t look. Even ignoring all of the anecdotal evidence of speed increases from switchers, there is plenty of interesting circumstantial evidence. For example, we have measured that the distance traveled by one’s fingertips using Dvorak is about 60% of that when using QWERTY, and involves more alternating hands and adjacent fingers (thus making parallelization possible less often). If it is true that QWERTY and Dvorak were equal in speed, then a QWERTY typist’s fingers would have to move about twice the speed of a Dvorak typist’s fingers. While it’s possible there’s something about the layout that causes fingers on QWERTY to move significantly faster, it doesn’t seem likely, and I’ve never heard an explanation put forth for this.